Sure, we all like to have our own space from time to time, but sometimes you really need the space. When families get larger, the things they own must follow suit. Typically, one of the first things to receive the size upgrade is the family vehicle. Once you reach the point that you can’t seat five comfortably, or if you just plain have teenagers, it’s time for something in the way of a 7-passenger SUV. To help you get a head start on finding the best one for your family adventures, we’ve researched Car and Driver, Consumer Reports, Edmunds, and Motor Trend to find the best 7-passenger SUVs of the 2011 model year. Properly equipped, the Yukon has a maximum towing capacity of 8,400 pounds. 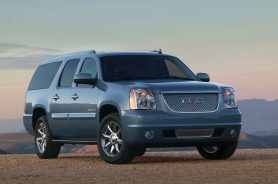 To take full advantage of that capacity, you’ll probably need to upgrade to the Denali with the 6.2L V8. However, doing so will also upgrade the price past $53K. Most should be sufficiently pleased by the 5.3L V8 engine and the option of four-wheel drive. Couple it with the 109 cubic feet of maximum cargo capacity, and you’ve got the best power option available for a seven-passenger SUV. It’s not terribly light on its feet in traffic, but load it down and hook a trailer up to it and watch it smile. Though the Veracruz is a midsize SUV, it is still a roomy seven-passenger vehicle. There are roomier options in the third-row seat, which is tight for adults but perfect for kids, but the first two rows are comfortable and spacious. Its ride is supple and quiet, but it can get bumpier than competitors on rough roads. 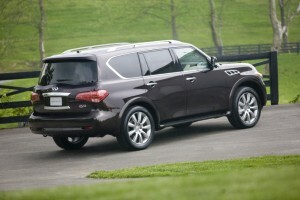 It is, however, one of only a few vehicles to earn an overall five-star rating from the NHTSA in their new crash tests. Materials quality is superb and the overall design is functional. 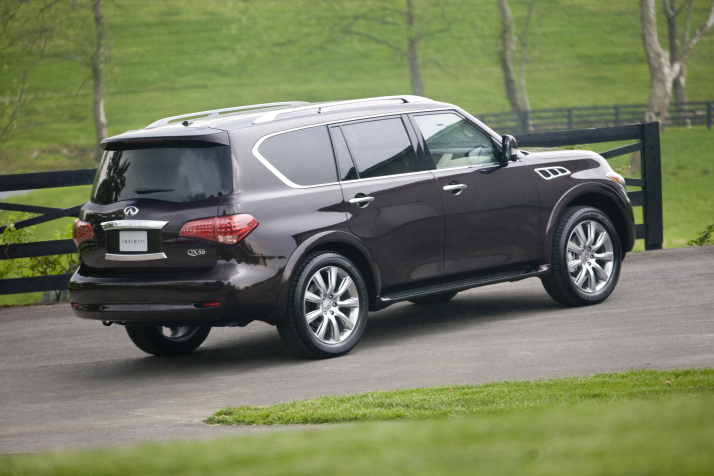 Though its boxy style may not appeal to everyone, the QX56 is the pinnacle of luxury in the seven-passenger SUV segment. With its 5.6L V8 engine it’s capable of towing up to 8,500 pounds, properly equipped. It also possesses a tow/haul mode and automatic-leveling rear suspension to enhance this feature. It’s not impressive when it comes to fuel economy, but we are talking about a large SUV here. Like most luxury vehicles, its strength is in its cabin. It boasts a long list of high-tech features and an array of storage space and comfort, all garnished in top-quality materials and craftsmanship. The Sequoia is a triumph in terms of comfort. The interior was designed by someone who understands the needs of parents, offering several family-friendly features. The second-row 40/20/40-split bench seat’s center section slides further forward than the rest of the seat, to allow for parents who have a child in a child safety seat to better reach him/her. Its cargo space tops out at 121 cubic feet with both rear seats folded down. The 60/40 third-row seat in the Limited and Platinum trims has both a power-recline and power-fold feature, making utilization of that cargo space much easier. Another crossover SUV is at the top of the list. 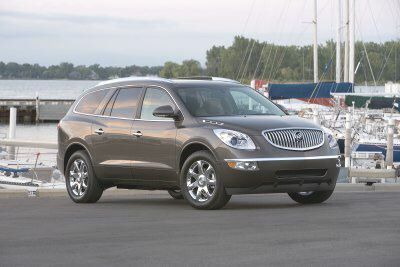 Though it looks smaller than some competitors, the Enclave is actually deceptively roomy. Its sleek design and curved front end take nothing away from interior head or legroom. The 3.6L V6 isn’t mind-rattling powerful, but still capable of handling a maximum load of 4,500 pounds, properly equipped. The cabin has an upscale design, decked in wood grain and chrome trim. With an MSRP that shoots straight down the middle of most competitors, the Enclave is the best all-around option for a seven-passenger SUV.